Author: Peter Krisch for The Australian Green Guides. Other Guides include : Insects, Spiders, Frogs, Snakes, Birds, Parrots, Mammals, Sharks and Rays. Description: Evolution, Conifers, Eucalypts, Paperbarks, Tea Trees, Bottlebrushes, Proteas, Banksias, Grevilleas, Wattles, Acacias, Casurinas, She-Oaks, Rainforests, Identification, Index. 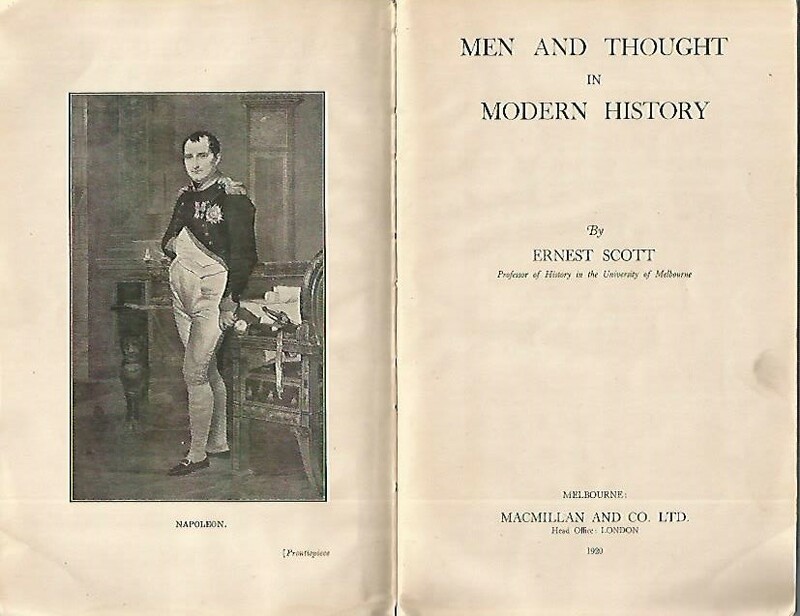 Title: Men and Thought in Modern History by Professor Ernest Scott, University of Melbourne 1920 Sc (Sydney Uni Tutorial copy). 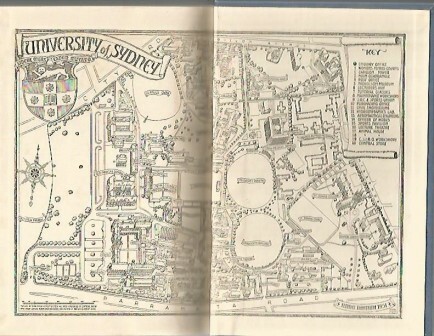 Condition:Cloth-bound softcover with title to spine and front cover, University of Sydney cancelled Tutorial Classes stamp to endpapers, STRAIGHT ROBUST & TIGHTLY BOUND in GOOD CONDITION. A good copy of an invaluable study of 24 men and their contribution. Description: includes news cutting 1945 re Rousseau. Chapters on Voltaire, Napoleon, Metternich, Blanc, Palmerstoun, Mazzini, Mill, Durham, Lincoln, Marx, Cobden, Darwin, Spenser, Bismarck, Gambetta, Gladstone, Disraeli, Chamberlain, Tolstoy, Arnold, Wilson & Wells. Title: Australian and New Zealand Association for the Advancement of Science REPORT of 29th Meeting August 1952 Hc 384pp. Publisher: ANZAAS, Sydney University, Sydney 1953, hardcover with illustrations, fold-out charts, by-laws, Assn. details etc. Condition:Crisp blue cloth-bound hardcover, bound by A H Pettifer, Government Printer, STURDY, INTACT, STRAIGHT & CLEAN in GOOD CONDITION without dj. 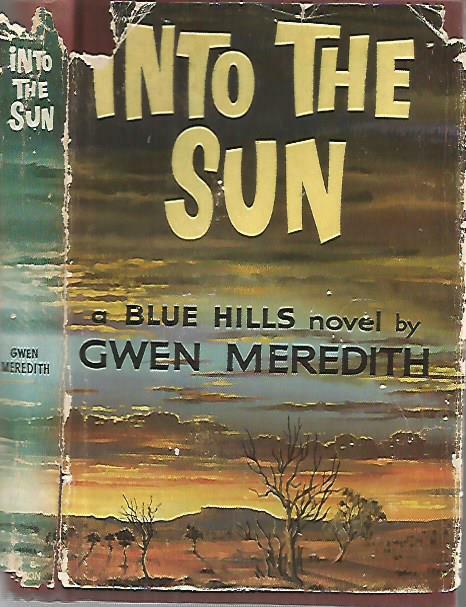 Author: Gwen Meredith, Australian author, travel writer and playwright. Condition:Crisp red cloth-bound hardcover with gilt title to spine, slightly faded at crown, STRAIGHT, TIGHT, ROBUST and CLEAN in Very Good Condition in an undersized FAIR original DUSTJACKET, 90% intact but chipped and edge-torn. Description: adapted from part of the BLUE HILLS saga, this is a tale of an isolated township in Central Australia in the 1950s. Publisher: Two Inspire, Double Bay, NSW, 2004 FIRST EDITION Hardcover oblong 8vo, photographic cover & endpapers, 10 chapters, colour plates, map, 170pp. 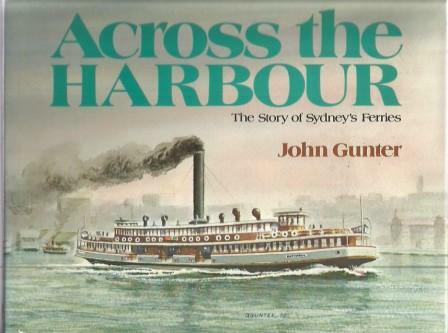 Title: ACROSS the HARBOUR by John Gunter 1978 Hc 1st Edition. The Story of Sydney's Ferries. ILLUSTRATIONS in COLOUR with Maps. Publisher: Rigby, Adelaide, 1978, FIRST EDITION, Hardcover oblong quarto with dj, with fine b/w and colour illustrations, 80pp. Condition:Crisp green hardcover with title to spine, STRAIGHT, TIGHT & ROBUST in VERY GOOD CONDITION, in an unclipped GOOD DUSTJACKET. 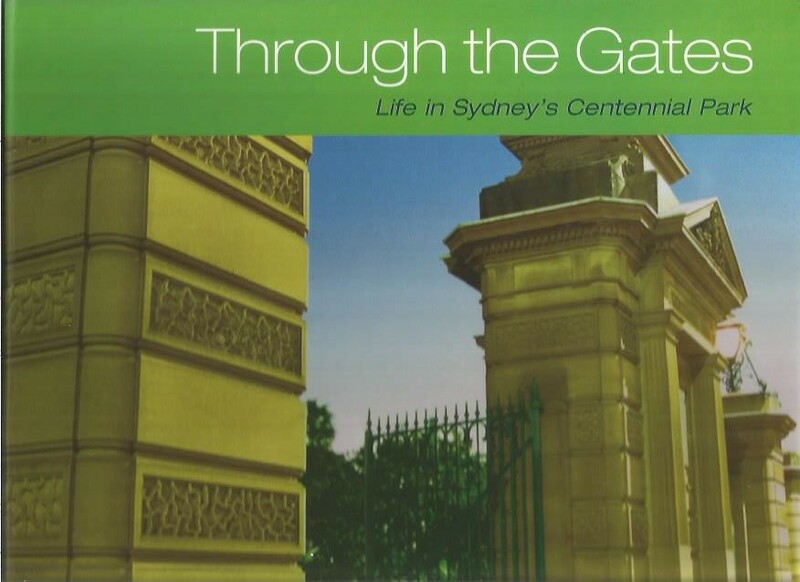 Description: A tribute to the 'Golden Age" of Sydney's Ferries, this book carefully details the history of the ships of Sydney Harbour, the classic steamers and the future of the Ferry. Author: Legislative Council and Legislative Assembly of New South Wales, Sydney, printed by William Applegate Gullick, Govt. Printer. 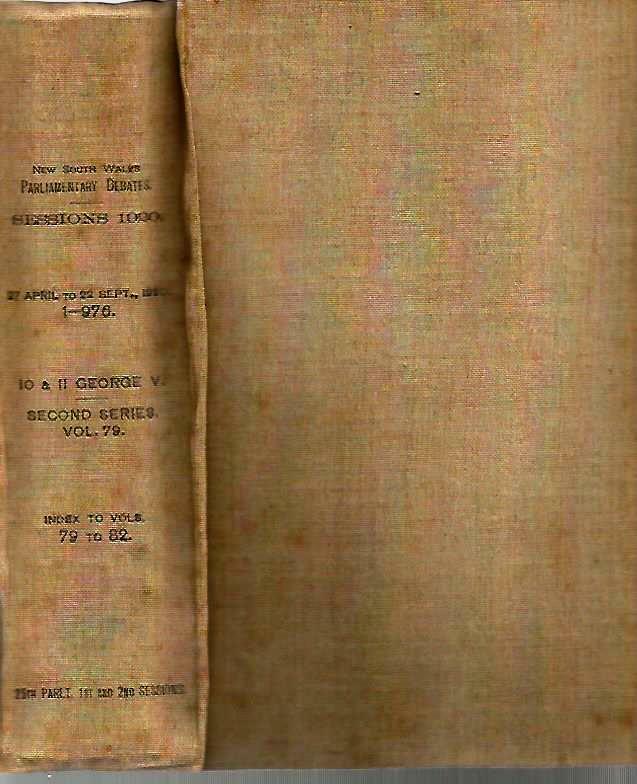 Publisher: Government of NSW, 1921, 976 pages in a large hardcover 8vo without a dj. Condition:Well-bound cloth-bound hardcover with age marks to ROBUST cover, no inscriptions, minor spine repair, in GOOD CONDITION. Description: The Government of the State of New South Wales Parliamentary Debates (Second Series) Sessions 1920 10 & 11 George X Vol LXXIX 27 April to 22 Sept 1920 during the time of the STOREY MINISTRY (The Hon. John Storey MLA). Publisher: Printed in the USA, published by VIZ Media, San Francisco, Cal, USA with translation rights from Hakusensha Inc., Japan. 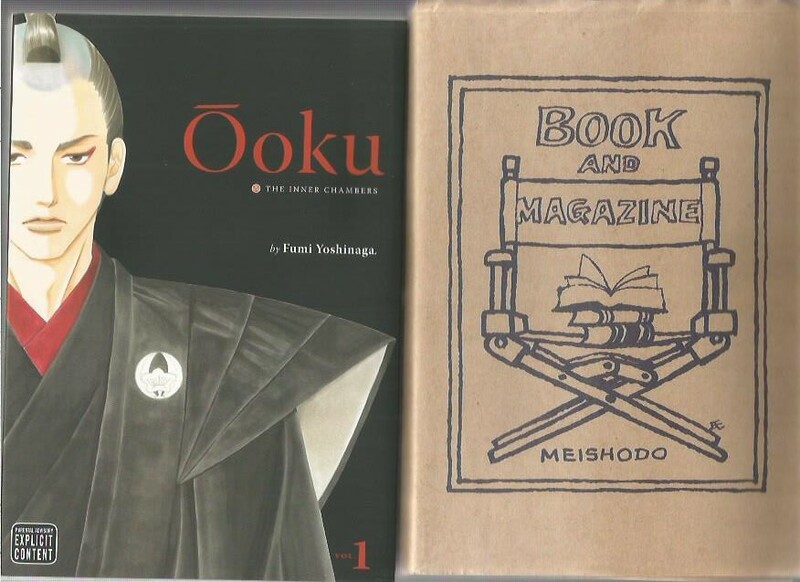 Condition:Crisp paperback in Very Good Condition with no creases to spine, in the original brown wrapper "Book & Magazine MEISHODO" Printed from right to left as is traditional in comics of Japan. Description: When a strange new disease that preys on men breaks out in Edo period Japan, women take on all the roles traditionally granted to men, including that of the Shogun, and the few men- precious providers of life - are carefully protected. 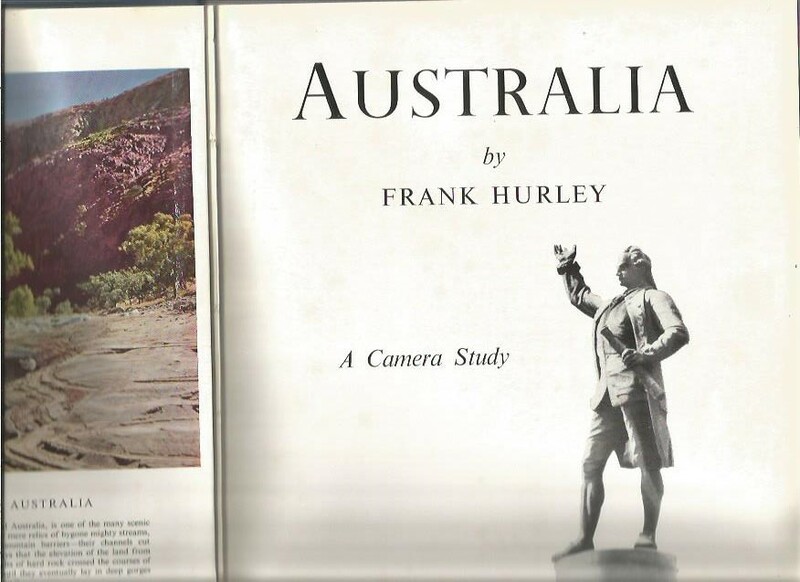 Author: Frank Hurley, celebrated Australian Pioneer photographer. Publisher: Angus & Robertson, 1959 revised third edition of the original 1955, large quarto 224pp, maps to endpapers, colour and b/w photographs and text throughout, in states. Condition:Crisp blue cloth-bound hardcover with title in gilt to spine & frcov., no inscriptions, STRAIGHT TIGHT & CLEAN in GOOD CONDITION without a dj. Description: Introduction by T A G Hungerford, a delight of photographs of the entire country, taken by the master photographer HURLEY. Condition:Blue cloth-bound hardcover with title to spine, STRAIGHT, CLEAN & TIGHT in GOOD CONDITION with no inscriptions, in an unclipped GOOD DUSTJACKET with slight rubbing, minor edgewear to jacket. 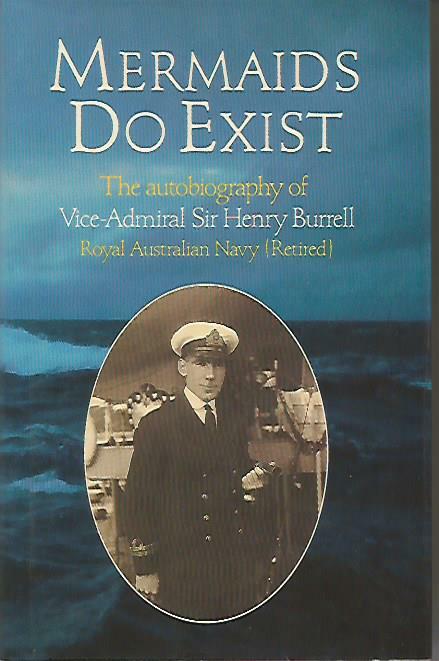 Description: The autobiography of Vice-Admiral Sir Henry Burrell, Royal Australian Navy (Retired). A Naval career from 1918 to 1962, when the RAN went from reliance on the Royal Navy to a more independent stance.